Several weeks ago I finished a month long project of posting one piece of “good Catholic news” on Facebook every day for a month. Prompted by a friend who kept posting bad news out of the Vatican, news which is admittedly not difficult to come by, I decided to try and find representations of the Catholic faith that showed Catholicism at its best. My intention was not to downplay the negative aspects of our ecclesial life in the contemporary era, but rather to show that not everything about Catholicism is a downer. What surprised me most about this exercise was the easiness with which I was able to find positive stories when I did an international search on Google and focused on the local. Whether a group of Catholics taking care of each other in Uganda, or a Catholic Church in the United States opening its doors for use by Jewish worshipers whose own synagogue had been destroyed, there are many, many examples out there of the Catholic faith at its best. The second surprise I received was the fact that there were about eight to ten bishops whose names showed up again and again: Dolan; Nienstedt; Cordileone; Paprocki; Sartain; Jenky; Chaput; Etc. Not surprisingly, the stories associated with these names all had to do with controversies surrounding the views espoused by these bishops. From the evils of gay marriage to the devil-wielding power of the Obama administration and all the way to the radical feminism that holds the LCWR in its grip, every time these names appeared it was to denounce, oppose, correct, warn, or call to task some element of the Church or society. Now, I’m quite aware that the role of a bishop is that of a teacher, and I’m also well aware of the need for prophetic challenge to the very real problems that exist in our world. Thus I am in no way suggesting that there is no legitimate place for the teaching and prophetic witness of bishops in the public sphere. I am, however, expressing disappointment that of the over 250 active bishops in the United States, the voices of a small handful dominate. Moreover, it seems to me that the diversity of interpretations regarding the various issues on which these handful of bishops have been speaking, a diversity clearly evident among lay Catholics, is really not represented in any substantial way among the voices that dominate the public conversation. 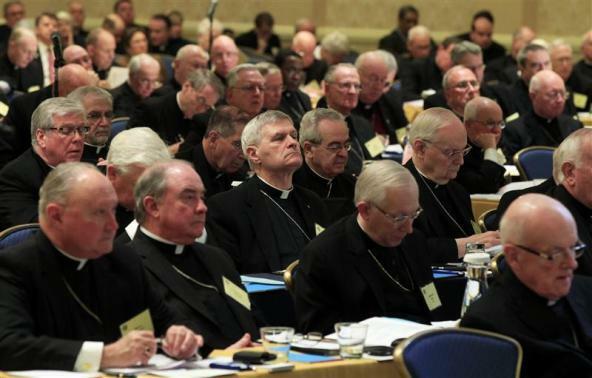 Some would say that this lack of diversity is due to the fact that these bishops are simply expressing the teaching of the Church, a teaching that brooks no diversity and requires no interpretation. I suppose that’s one way to look at it. The fact that there are, however, faithful Catholics – some of them even part of the Church’s leadership, e.g., the recently deceased Cardinal Martini – whose faithfully formed consciences have led them to differing interpretations regarding certain contemporary issues, seems enough evidence to me that any sense of the Church’s doctrinal and moral teaching as self-evidently intelligible and intrinsically clear in expression and proposition borders on doctrinal fundamentalism. Does this mean that there is no truth, that a variety of interpretation means everything is relative and majority opinion holds sway? No, certainly not. It does mean, however, that our knowledge and the expressions of our knowledge of objective reality – a reality that includes Revelation – is and are perspectival. From within our limited perspective on the world, however, it is certainly possible to have a reliable cognitive vantage point from which to adjudicate truth claims. This does not mean that such adjudication is easy or without conflict; it is not inherently self-evident or unmediated. The problem here is not so much whether or not there is truth (unless of course you’re a complete relativist, in which case I have nothing to offer you nor you to me because it’s all relative), but rather with how it is that we come to know and express that truth. Given the perspectival nature of human being and knowing, coming together in conversation would seem of paramount importance. On this theory it is precisely conversation around variety and diversity that leads to the most fulsome grasp of truth; hence things like synods, councils, committees, etc. I am not suggesting that each and every conversation leads to the truth, but rather that without conversation there is no human knowledge or expression of truth, there is instead the simple and dominating exercise of power. When truth is adjudicated through power, diversity is swept aside and authority is equated with objectivity, the number of voices are narrowed and loyalty is perceived as submission to authority-as-objective-truth. I am perfectly aware of the media’s hand in all of this. While I used to be wary of charges that the media is anti-Catholic, this exercise has been proof-positive for me that the media has a story of Catholicism as doctrinaire, out of touch, and bound to destroy all liberal freedom in this country. The story apparently sells, and there are several bishops more than happy to provide fodder for this particular narrative. Unfortunately, I think aside from the admiration of a particular population of self-defined traditionalist or conservative Catholics, this story and the bishops who feed it are actively working against the new evangelization to which they have been devoting much time as of late. Ultimately what I am saying is that we need more bishops lending their voices to the conversation and we need to remind ourselves and others that when the media proclaims “Catholic Bishops Say ____” or “The Vatican Says ______” or “The Catholic Church Says ______”, more often than not it’s a handful of bishops who say. It would also be nice if Church leadership would hear and listen to the voices of lay people in their part of the ecclesial conversation called the sense of the faithful . Finally, as long as I’m wishing, it would be nice if people (and advertisers?) weren’t only interested in hearing about disagreements over controversial issues but also paid to read stories about everyday Catholics doing everyday works of justice, mercy, love and kindness all over the world. If you want to get at the truth of the Catholic faith, that’s certainly one place to start. I was thinking the other day about the Synod of Bishops and reading some of the comments from the bishops there and wondering if it is too much to hope that some day the church might have a synodal structure with both a House of Lords (ie, the bishops) and a House of Commons (ie, the lay folk). PS Brad — I wish you would post a summary of your month-long positive comments about the church here. Thank you for this thoughtful commentary. After reading your observation that many contemporary moral issues have become a one sided discussion, my first thought was of Peter Maurin and Dorothy Day’s principle of roundtable discussion for the clarification of thought. Dorothy Day described her community in the following way, but perhaps this applies to all of us. “We area slipshod group of individuals who are trying to work out certain principles – the chief of which is an analysis of man’s freedom and what it implies… trying to overcome hatred with love.” I liked the balance you articulated between the call of the church to teach and the call to prophetic imagination. With respect to your observation on the media, the press often treats the Church as a multi-national corporation with the Pope as CEO and the bishops as a group of Senior Vice-Presidents. Of course it does not work this way. As Cardinal Avery Dulles described the institutional church is one model of church, but other models must also be present (Communion, Sacrament, Herald, Servant, and Community of Disciples). Catholic means universal, not uniform. The same church that celebrates the great intellect of St. Thomas Aquinas also celebrates the great heart of St. Francis of Assisi. Thank you so much, P0430, for your thoughtful engagement and response. Your comments add a more fulsome element to what I was trying to get at and I appreciate them immensely.